Now we have come to the reason why U2 do what they do. In nearly every interview that they have given, the answer is invariably the same to the question of how they make their music. They write and record their songs with the intent to perform them in front of an audience. For all their multiple transformations, one thing has stayed the same since their formation: they are a live act. In the beginning, they could barely play their instruments, Bono sounded like a punk wannabe and the only gigs they got were in small venues around Dublin. But they had something. Watching the band’s early performances, it is obvious that they were a little rough and needed a polish, but they were most certainly talented. Bono knew how to play to the audience and to the camera. For all the work they do in the recording studio, or on a music video set or during a public relations event, the stage is where they really earn their money. Playing in front of a live audience—in full rock mode—is where they eat. The critics can say whatever they want about them, but they can’t say that band doesn’t go all in at the show. I’ve gone to shows where there were some in our group who didn’t even like the band and yet, they were blown away by what they experienced. 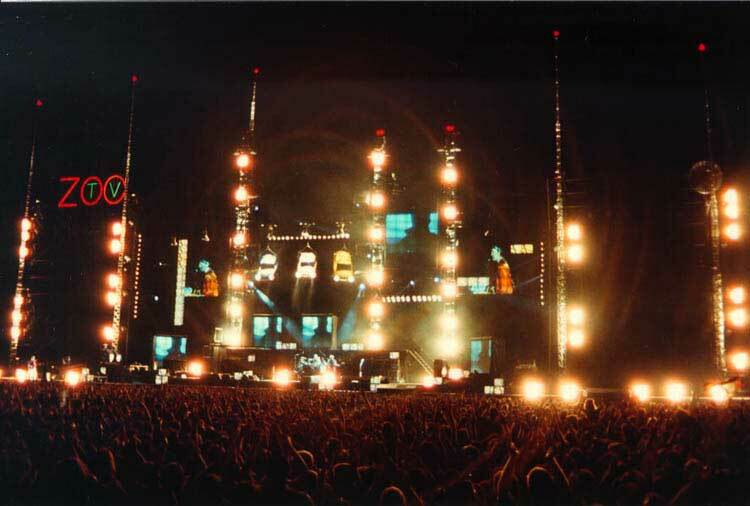 And even though they didn’t become fans, they understood that band always put on one hell of a show. U2 is a live band, but so what? There are hundreds if not thousands of successful bands that do what they do. What makes them so special? First, their shows are always a spectacle. From ZOO TV to i+e, they changed the concert experience. I remember being at The Joshua Tree Tour in 1987 and having my mind blown away. But, it was only the third concert I had ever been to and the first big one. Yet as big as it was, it is considered minimalist compared to the other tours that followed. Their shows are huge. I believe the idea of video enhancement came into fruition when Willie Williams was tapped to work on the production design. The band had used projected images on their tours before, but Williams’ vision—along with artist Catherine Owens—took the band’s shows to a new level (who could ever forget the dancing Trabants?). From that point on, they always incorporated some form of video in their performance. Does that make for a better show? I believe it does. 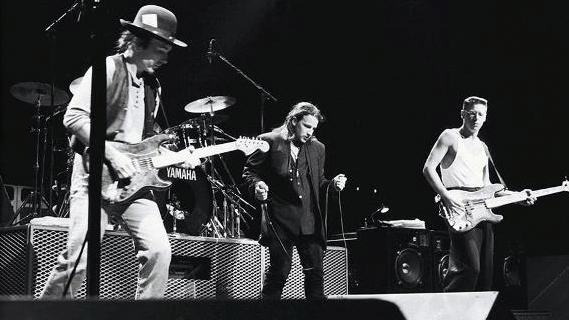 I remember seeing the band on stage during the original Joshua Tree Tour and thinking it was the greatest show ever. I had no idea that they would continue to set the standard for an awe-inspiring rock show for the next three decades. By having the name Joshua Tree Tour, there is a deliberate look back to the original. It is just a celebration of the album and tour that cemented their status in the rock pantheon? Or is it also a statement of enduring relevance of a band in its fourth decade of existence? Not many bands can claim that. I’m not talking about bands still playing shows in small to medium-sized venues. I’m talking about sold-out, stadium-sized arenas around the world. A part of me wishes it would be a little more stripped down. There was also something very special about the austere simplicity of The Elevation Tour. I like the idea of four guys on a simple stage just playing the music. Obviously, their set list will include other songs—and I’m hoping some from Songs of Experience—so I have no idea what they will be doing. I am deliberately avoiding any spoilers so that I can experience the stage and set for the first time when I walk into Levi’s Stadium. A part of me also wishes I could recapture the same feelings I had when I saw my first TJT concert. But sadly, too much time has passed. I’m a different person than the high school kid who was prepared to beg his mother to let him go to the show. In previous posts (When I Became a Fan, parts I, II & III) I wrote about how the album and tour came at a tough time in my life and helped me get through it (along with family and friends). Nostalgia is such a weird thing. Sometimes we go looking for the things, places, or times when our lives were hard or unhappy. It’s not to be unhappy, but to remember how we got through it. And sometimes we just want to recapture a moment when everything was perfect. This entry was posted in Uncategorized and tagged #@U2Forum, #JoshuaTree, #JoshuaTreeTour2017, #U2JoshuaTree, #U2Start, u2 by achtungninja. Bookmark the permalink.